A female 'roo hammers down the road. A platypus swims through her river. The Egyptologist from Te Papa. A thievish native mouse selects the appropriate lock pick. A fantasy tale of the destruction of a peaceful community. An attractive winged male furry with leonine attributes. A beach miaow is really excited about her catch. Roos! Mmm. Roos. Mmm. Godzilla. The story of Lttr and his people as they seek a cure. A tribal furry femme with an Australian flavour. If foxtaur vixens happen to be a trifle vain, who can they they don't have the right to be? 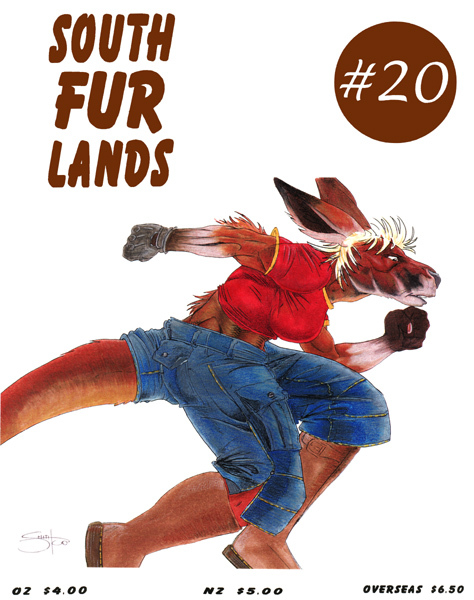 Furry Bodies continues in another episode! Aliens! Furries! Michael makes his allegiance known. A lovely fox lady glances towards the viewer. "This is the story of a gerbil named Bevan..."
Illustrations for the story, oh my! "You will close that door now! And destroy that camera too!" A foxtaur huntress pauses to enjoy the breeze in her fur while standing on a windswept hillside. What you should take account of when using a fishing rod. An African Hunting dog relaxes amongst the grass. This webpage last updated 11th March 2001. Page design by Silverblue.